How To Add Twitter Feed To Your Blogger Blogs? Twitter allows bloggers or website owners to embed their twitter timeline straight into their websites or blogs. If you are trying to grow your twitter following or if you want your readers to be updated with your recent tweets then this tutorial is for you! 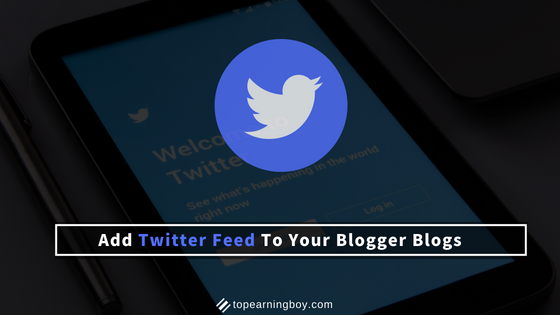 In this tutorial we will learn how to add latest Twitter feed to your Blogger blogs. WordPress users can also follow the same steps to embed Twitter feed in their blogs. Add Twitter Feed To Your Blogger Blogs? Now a code will be generated, copy that code. In the content field add the Copied Code and Save! After following all of the simple steps above, you will see the Twitter feed widget in action on your blog. This is indeed a cool and simple way to add you twitter timeline or feed to your websites or blogs. Thanks to Twitter Publish and above all my readers who take out their time and read my tutorials. If you still have any query then comment in the section below or directly contact me. If you like our tutorials then don't forget to follow us on Facebook and Twitter. We are always active to help and live up to your expectations!